For decades, doctors have developed methods to diagnose how different types of cells and systems in the body are functioning. Now scientists have adapted biomedical techniques to study the vast body of the ocean. In a Science paper, scientists demonstrate that they can identify and measure proteins in the ocean, revealing how single-celled marine organisms and ocean ecosystems operate. "Proteins are the molecules that catalyze the biochemical reactions happening in organisms," says Woods Hole Oceanographic Institution (WHOI) biogeochemist Mak Saito, the paper's lead author. "Instead of just measuring what species are in the ocean, now we can look inside those organisms and see what biochemical reactions they're performing in the face of various ocean conditions. It's a potentially powerful tool we can use to reveal the inner biochemical workings of organisms in ocean ecosystems--and to start diagnosing how the oceans are responding to pollution, climate change and other shifts." The emerging biomedical technique of measuring proteins - proteomics - builds on the more familiar field of genomics that has allowed scientists to detect and identify genes in cells. "Proteomics is an advanced diagnostic tool that allows us to take the pulse of, for example, phytoplankton cells while they respond to environmental cues," says paper co-author Anton Post, currently on leave from the Marine Biological Laboratory in Woods Hole, Mass., and a program officer in NSF's Division of Ocean Sciences. The new study is an initial demonstration that proteomic techniques can be applied to marine species not only to identify the presence of proteins, but for the first time, to precisely count their numbers. "We're leveraging that biomedical technology and translating it for use in the oceans," Saito says. "Just as you'd analyze proteins in a blood test to get information on what's happening inside your body, proteomics gives us a new way to learn what's happening in ocean ecosystems, especially under multiple stresses and over large regions. "With that information, we can identify changes, assess their effects on society and devise strategies to adapt." For their study, the scientists collected water samples during a research cruise along a 2,500-mile stretch of the Pacific Ocean from Hawaii to Samoa. The transect cut across regions with widely different concentrations of nutrients, from areas rich in iron to the north to areas near the equator that are rich in phosphorus and nitrogen but devoid of iron. Back in the lab, the scientists analyzed the samples, focusing on proteins produced by one of the ocean's most abundant microbes, Prochlorococcus. 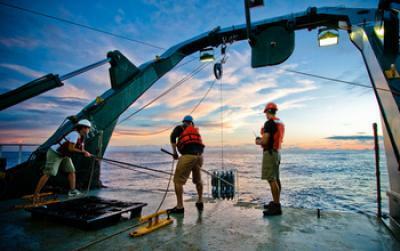 Scientists used a CTD (conductivity, temperature, depth) rosette to collect ocean water samples. They used mass spectrometers to separate individual proteins in the samples, identifying them by their peptide sequences. In subsequent steps, the scientists demonstrated for the first time that they could precisely measure the amounts of specific proteins in individual species at various locations in the ocean. The results painted a picture of what factors were controlling microbial photosynthesis and growth and how the microbes were responding to different conditions over a large geographic region of the sea. For example, in areas where nitrogen was limited, the scientists found high levels of a protein that transports urea, a form of nitrogen, which the microbes used to maximize their ability to obtain the essential nutrient. In areas where iron was deficient, they found an abundance of proteins that help grab and transport iron. "The microbes have biochemical systems that are ready to turn on to deal with low-nutrient situations," Saito says. In areas in-between, where the microbes were starved for both nutrients, proteins indicated which biochemical machinery the microbes used to negotiate multiple environmental stresses. The protein measurements enabled the scientists to map when, where, and how ecosystem changes occurred over broad areas of the ocean. "We measured about 20 biomarkers that indicate metabolism, but we can scale up that capacity to measure many more simultaneously," Saito says. "We're building an oceanic proteomic capability, which includes sampling with ocean-going robots, to allow us to diagnose the inner workings of ocean ecosystems and understand how they respond to global change."